A research scientist in sow lactation with Agriculture and Agri-Food Canada says the selection of replacement gilts for breeding should begin as early as weaning. 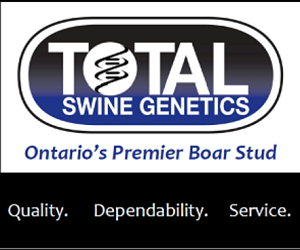 “Maximizing Performance of the Sow” was discussed last week as part of the 2019 London Swine Conference. Dr. Chantal Farmer, a Research Scientist in Sow Lactation with Agriculture and Agri-Food Canada in Sherbrooke, says with today’s larger litter sizes it’s critical to select gilts that will perform well. Now a days this is more of a problem because now we high prolific litters. We’ve had for the past ten years or so. With this greater litter size, what’s happened is that each piglet is ingesting 22 to 42 grams of milk less with each additional piglet. So first I’m going to say, obviously, you need to look at the udder. So the number of teats, if you have less than 14 it’s not a good thing. You should have 14 good potentially productive teats so no invagination of teats or teat buds. The other thing that’s really interesting is that now a days we are even looking at the performance of these animals before, like in the neonatal part of their life. Piglets that are heavier and grow more will most likely be better in terms of reproductive performance and also longevity. You want a piglet that has a good weaning weight and also once it gets older you look at the underlying factors. Dr. Farmer says, in the past, the selection of replacements gilts for breeding began at puberty but now it’s starting much earlier.